Why yes, it is Wednesday. As you read this, TD and I are on a teeny tiny plane headed to Montana. If his predictions are correct, at some point we will get snowed-in. To hear TD explain it, this will trigger the zombie apocalypse whereupon only the strongest (or least best tasting) will survive to see spring. Yeah, I don’t really understand either. But, just in case, here is this week’s post. Depsite my agonizingly detailed planning, about 2/3 of the way through my holiday baking, it became clear to me that I was going to need a bigger boat. And by bigger boat, I mean more baked goods. 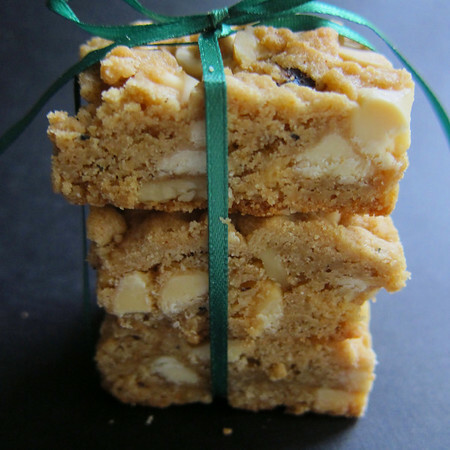 As my caramel crunch square supply quickly dwindled, I sprang into action with a recipe I’ve been playing with for a couple of months: the brown butter blondie. 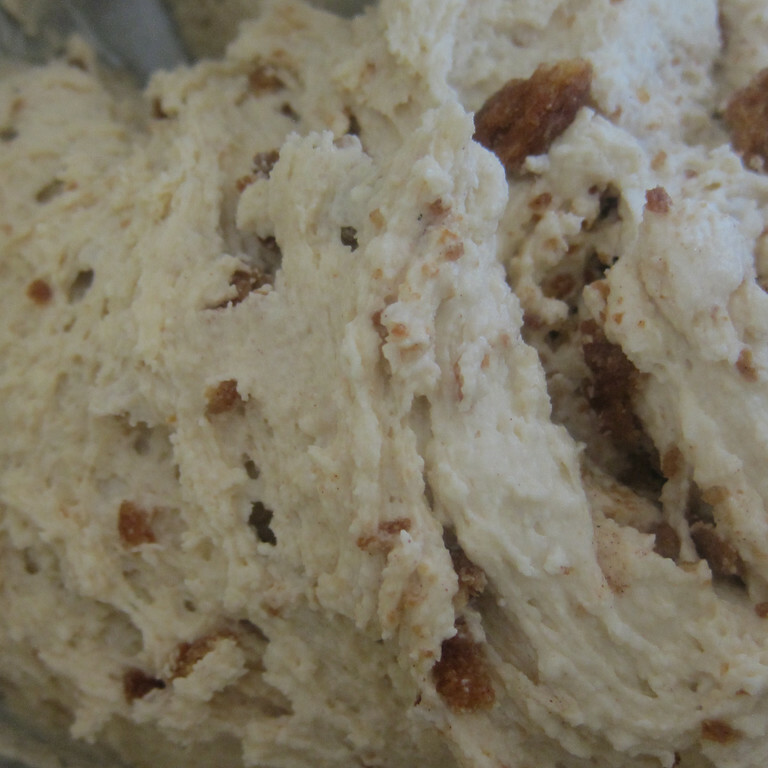 Here is the flavor profile: brown butter, roasted walnuts, white chocolate. The BBBs also have the added benefit of a neat cut. You know what I mean, no sloppy edges or oozing middle (not that, provided the appropriate context, sloppy edges and oozing middles are a bad thing). 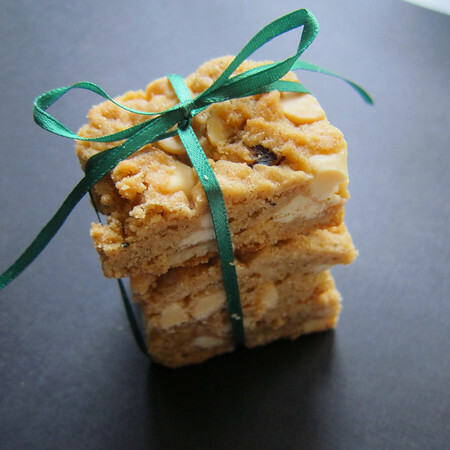 This is a slightly fancy bar that comes together relatively quickly and is made from ingredients that are generally on-hand. Plus and plus. In fact, these went together so easily that I knocked out two batches in the early morning hours before work. I am officially signing-off until the 28th. That’s assuming I’m not lobotomized by a brains seeking Santa Claus along the way. Which would be sad because I’m all set to pontificate on the 2013 Pantone color of the year and what it has to do with a cognitive condition I never knew I had until TD scientifically proved I am statistically weird. To brown butter: in a medium heavy-bottomed saucepan, add butter. Cook over medium heat, stirring constantly until the butter takes on a deep golden color. Remove from heat and allow to cool to room temp. This step can be done in advance. Preheat oven to 350 degrees. Line a 9X13 inch baking pan with parchment and butter the parchment and sides. In a separate bowl, sift together flour, salt and baking powder. Set aside. 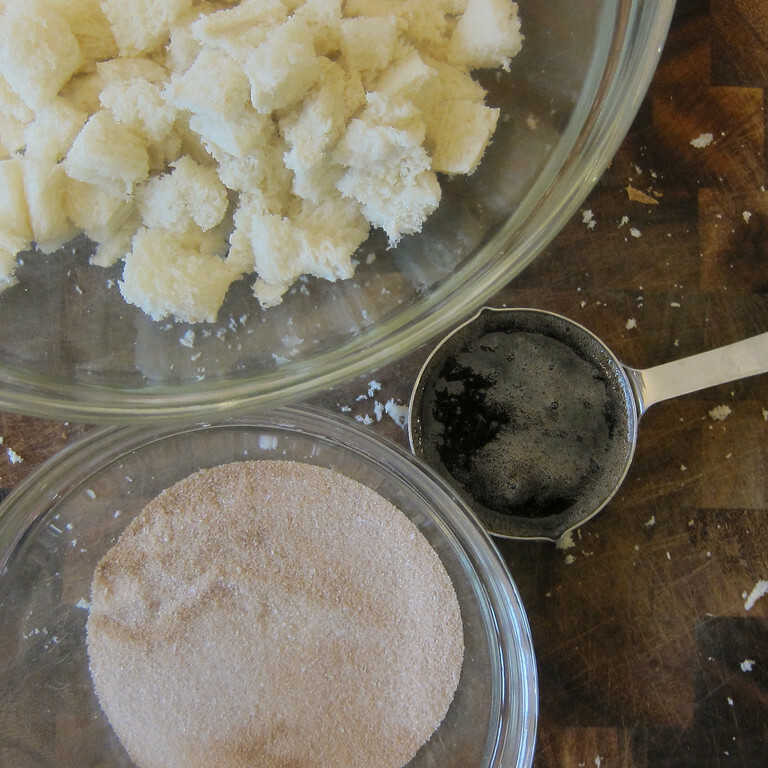 In a standing mixer, add sugar to brown butter and cream until smooth, roughly 2-3 minutes. You will not get the same consistency as you would with regular butter straight from the stick. Don’t worry about it. With the mixer running on medium, add eggs one at a time allowing them to be completely incorporated after each add. Let the mixer run for another minute and add vanilla until mixed- in. Add-in flour mixture. With the mixer on its lowest setting, run until the flour is just incorporated. Watch carefully, this will happen quickly. By hand, fold-in chocolate and walnuts. Gently press the dough into the prepared pan. Bake for 25-30 minutes or until the top is pale gold and the edges are just starting to turn a deeper gold. True to the namesake of her bakery, Christina Tosi of Milkbar has a particular affinity for things cereal and cracker related. Her cookbook contains several recipes for a category of concoctions she calls “the crunch.” Operationally defined, crunches are a an array of recipe add-ins whose primary ingredient is most often derived from snack foods including cereals, crackers, chips and pretzels. 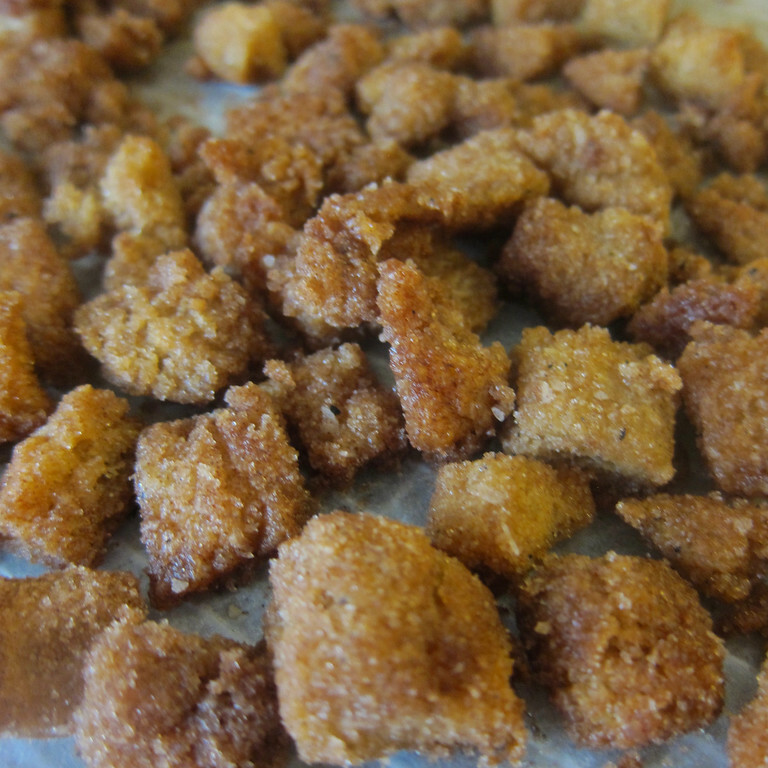 Among these little nuggets of nirvana I discovered a formula for homemade cinnamon toast crunch, crunch. Well, she had me at the first crunch. The technique involves browning butter in the microwave. ‘Go ahead she says, it’s easier than stovetop.’ Apparently not for my microwave. Oh, I got brown butter. I also got an appliance covered in a layer of butter so thick you could grease toast with it for years. But, maybe your microwave is better behaved. The next ingredient is white bread. I can’t tell you how odd it was to walk down the bead aisle looking for plain white bread. We don’t eat a lot of bread in our household. Whenever I buy a loaf I have to keep it in the fridge because left in the pantry, it’ll go moldy before we even get halfway through. Of course, the mold may have something to do with the fact that I buy fairly gross good-for-you grown up bread that doesn’t have a lot of preservatives. So buying white bread was a bit of a wonder (uhm…see what I did there…wonder…bread). Off with the crusts and into 1/2 inch pieces. A gentle toss with the brown butter and a cinnamon sugar mix and it’s time to get toasty. Out of the oven, this stuff is ridiculous. Seriously…crunchy and buttery and cinnamony. But wait. 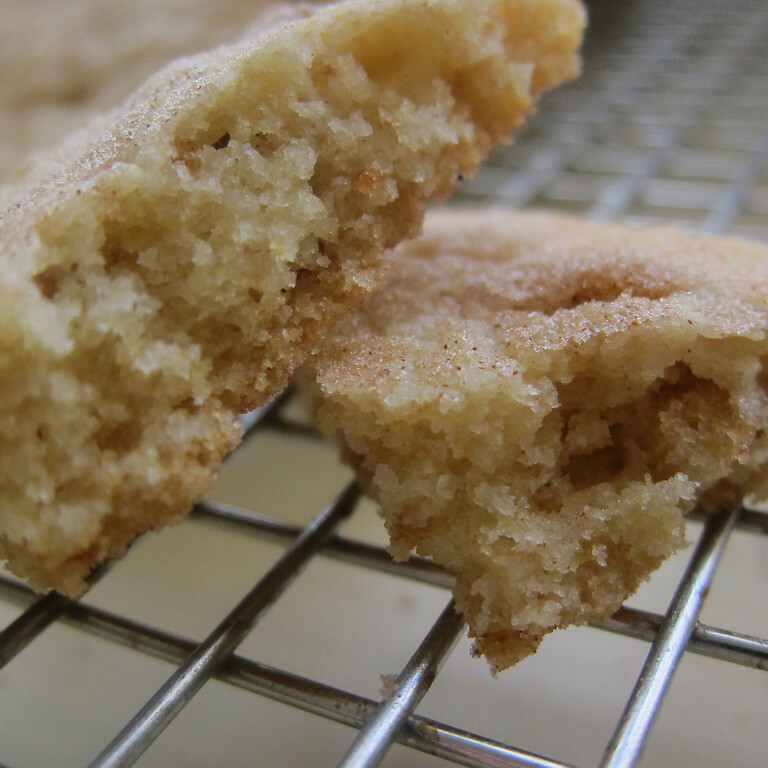 Remember the mother snickerdoodle recipe from last week? Well, Christina does encourage the reader to experiment. 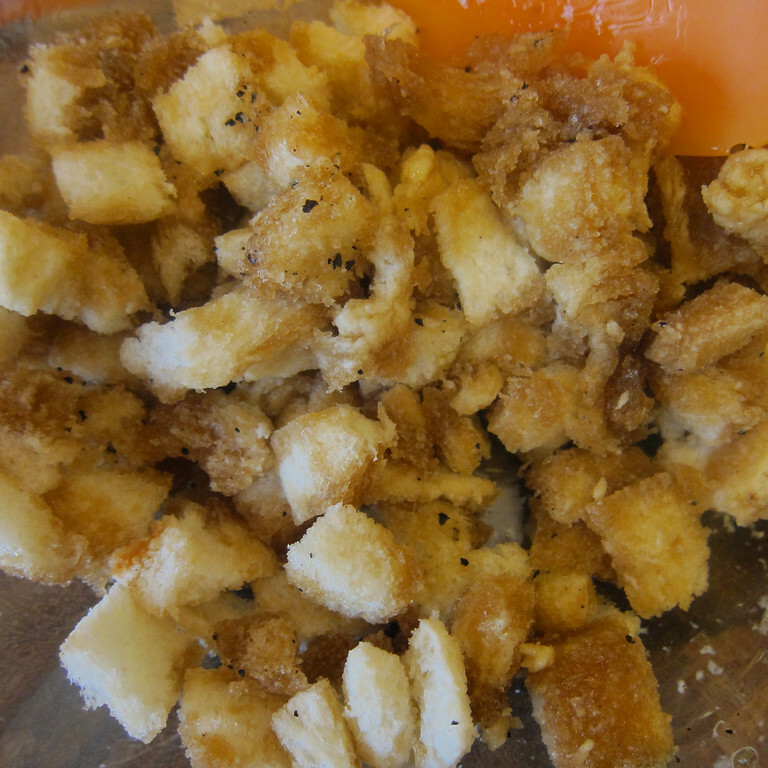 So, what do you think might happen if we chopped up the cinnamon toast crunch crunch into smaller bits. Then carefully folded them in to the snickerdoodle dough and rolled each ball of dough in cinnamon and sugar before baking? You get a snickerdoodle on steroids my friends. Lumineers. What? Everyone else is. To brown butter. Place 1/2 C unsalted butter in a microwave-safe dish. 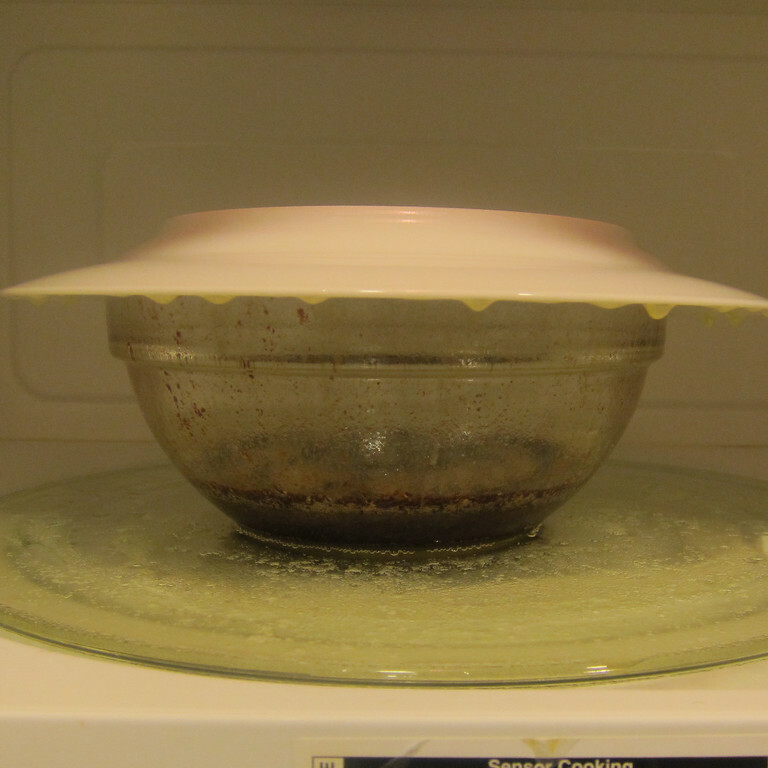 Cover with a microwave-safe saucer and microwave on high for 3-5 minutes. The butter will melt and then start to pop. 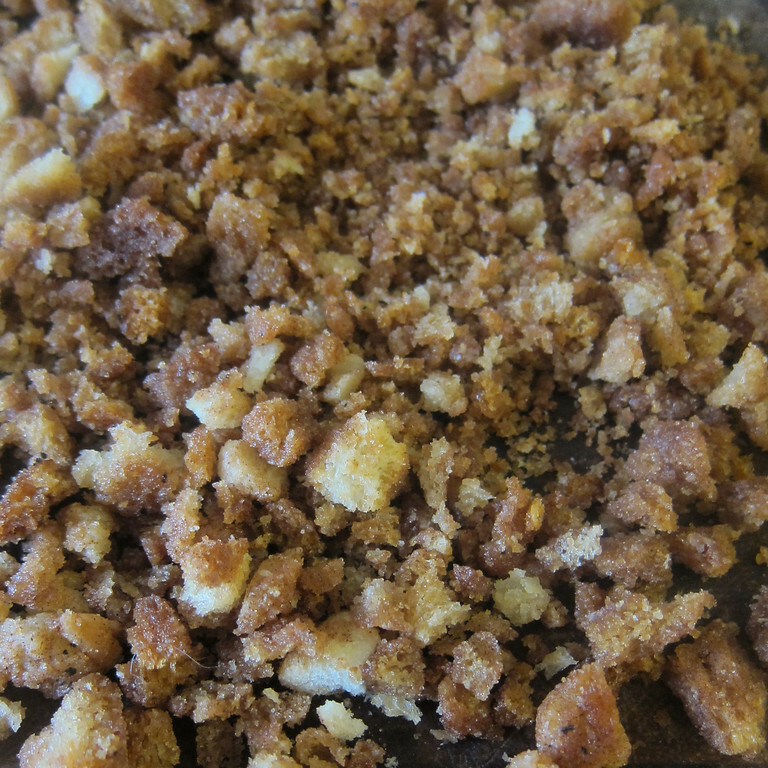 If you are the TMH’s microwave, it’ll then explode leaving you with about 1/3 of a cup of browned butter. Set butter aside to cool. 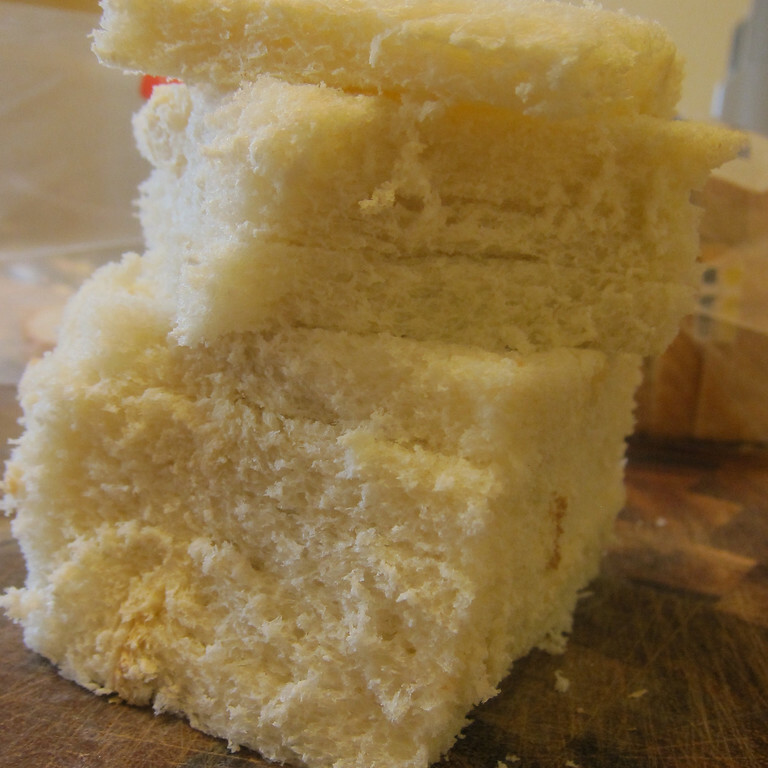 Tear or cube the bread into 1/2 inch pieces. Put it in a bowl, douse with the brown butter and let soak for about a minute. Add the sugar, salt and cinnamon to the mix and toss well. 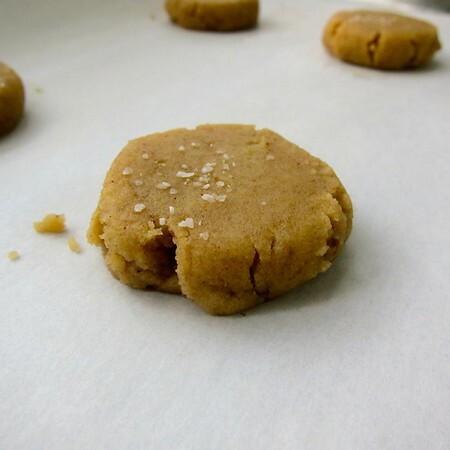 Spread the mixture on a parchment-lined baking sheet and bake for 25 minutes. Pull from oven and break-up with a spatula. Bake an additional 5 minutes. Cool the cinnamon toast crunch crunch completely. Chop into crumbs a little bigger than orzo. 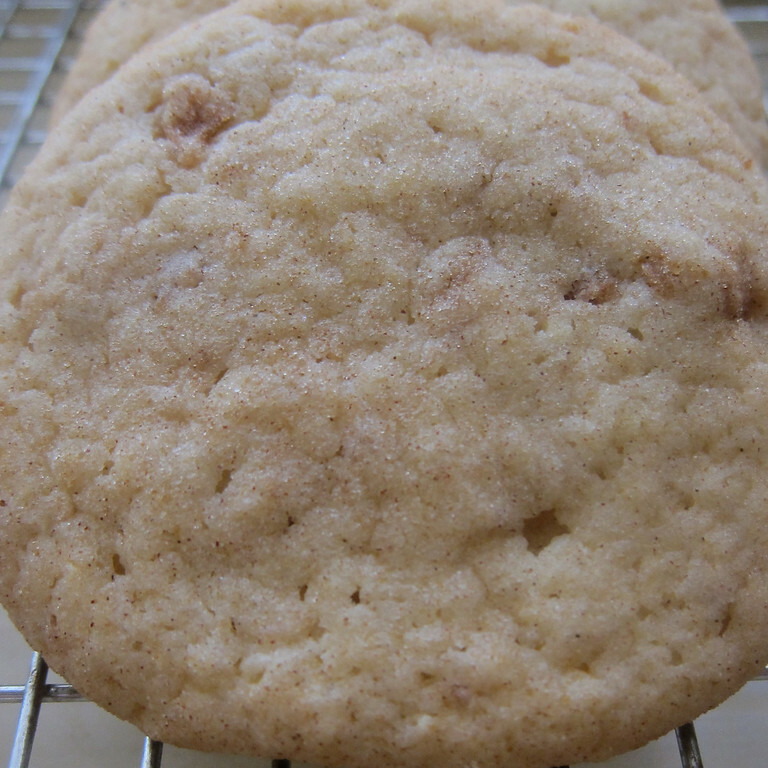 Go here for the base snickerdoodle recipe and follow directions but swap-in 1/2 of the cinnamon toast crunch recipe for the birthday cake crumbs. 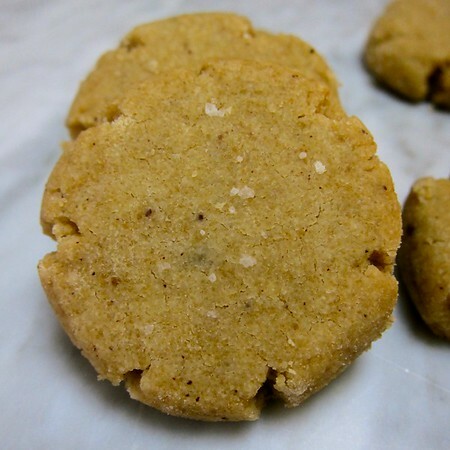 When scooping dough, roll each ball in the cinnamon sugar mixture, set on parchment lined baking sheets and flatten a bit with the bottom of a cup (about 3″ diameter). Follow the remaining instructions for the sprinkle cookies.